I know you aren't supposed to have favorites, but I do. This is Beflowered. She is 74" x 96" and her Kona rainbow palette makes me happy. Her big, varied, blossoms make me happy. She uses big 8" triangles (gotta keep it simple somehow) cut using a 60 degree Creative Grids ruler and I love her. Really really love her. 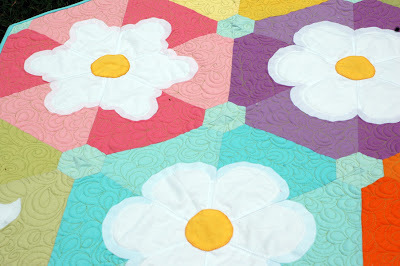 I love the solids but can't wait to see what else you all dream up! Oh my - look at the little curlicues around the edges! Sara, from Sew Sweetness, stayed true to her name and was the brave soul who tested this one for me. Thanks for believing in my design idea, Sara, and to plunging in head-first. Sara will be posting her version today and she used black blossoms so go over and see! Oh my - she sent me the sweetest picture of her kids laying out the blocks and it is adorable! But I'll let her tell you about that. 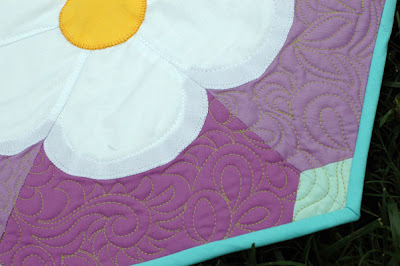 I entered this quilt in Blogger's Quilt Festival. Have you been there? 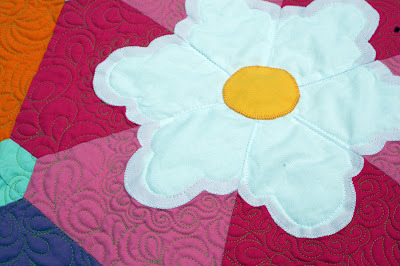 There are so many fantastic quilts displayed - makes your mouth water! Oh, I do love this as well, it has a very fresh Spring look to it and how fantastic does it look in solids. I see why this is your favorite. It's darling! I love the pointy edges! I'm sure there is a more "quilterly" name for them, but I don't know what it is! 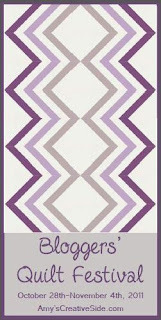 Beautiful pattern Amanda - may be my new favorite one of yours - really like it done in solids too. 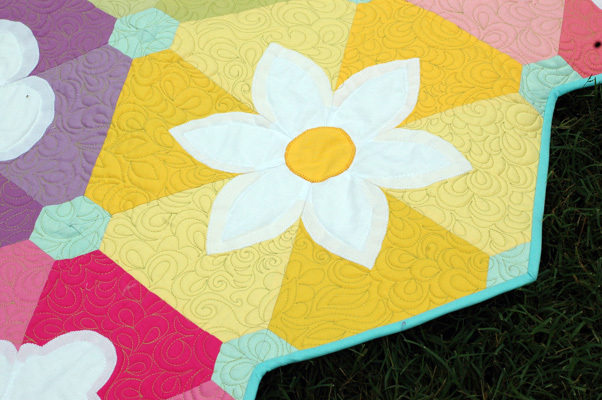 This quilt is so colorful and bright. I love the colors in it. 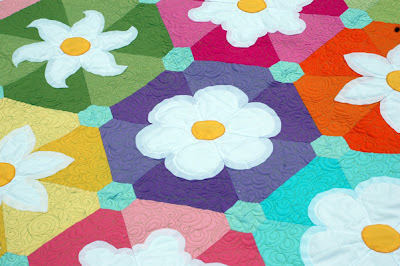 I like the flowers in the middle of each of the octagon shapes. It looks really springy and happy!! I like it! "Happy" definitely describes this quilt! So so fun. You Amanda have got to stop this!!! Everytime I open my email I have another from you!!! And these quilts are just getting cuter and cuter! I want to make them ALL but I know that I can't and I just don't know where to start. I'm getting overwhelmed by all this cuteness!! Luckily I have 3 granddaughters so I have a reason to make them and I know they will be adored. 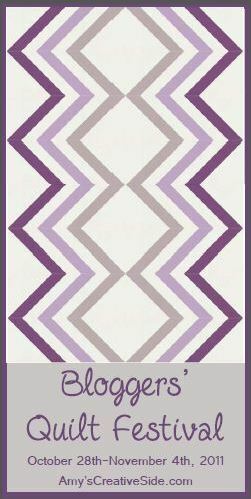 Another great pattern on my list!!! You have captured all the favorite elements into one quilt--hexies, flowers,color! I love the combo of all the different flower shapes. This would be so fun to make! OOh Another winner. The first thing I noticed after the initial peek at the page was the curlicues around the white flowers. Wow. AWESOME! Love, love, love this one too!!! 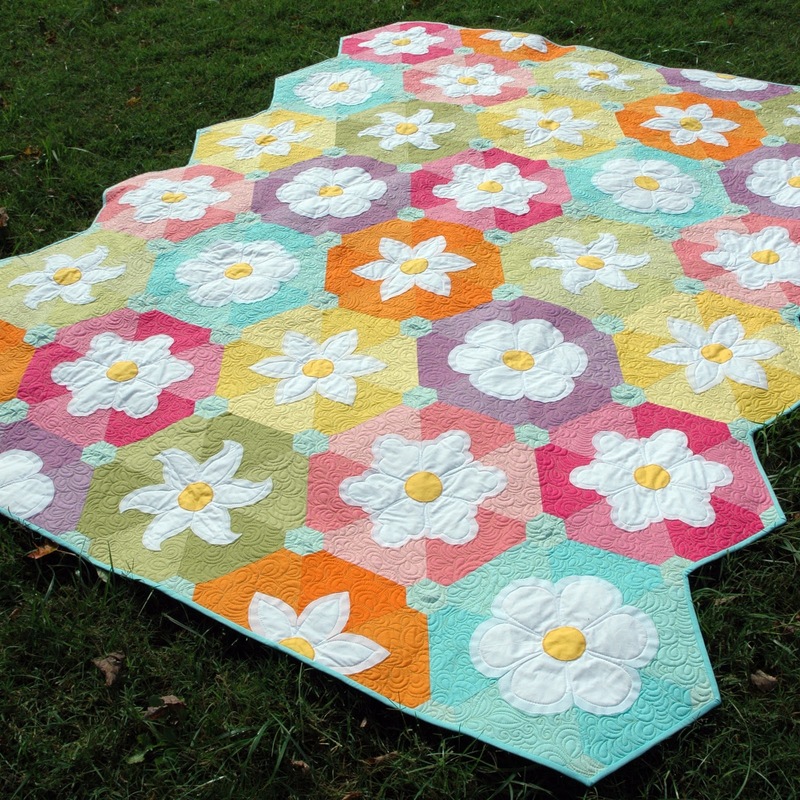 You need to start a frequent buyer program for your quilts, because I'm going to be poor between your patterns and fabric :-D Beautiful job!!! Wish I could be as brilliant as you, but at least I can admire, and thank goodness I can at least buy some of your creative genius!! Have a great weekend!! Gorgeous! I love your patterns, too! Archie the Wonder Dog is a cutie! It could easily be my favorite Too. This is so Beautiful! I love the colors! Thanks for sharing! 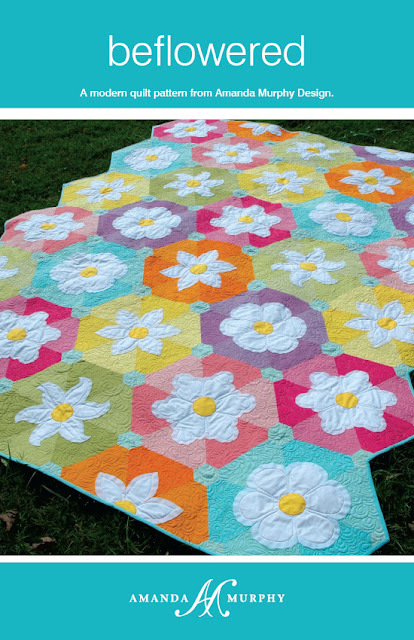 I saw this on Sew Sweetness blog and thought it was so pretty I needed to do it and went to your blog to get information. Then I see yours and I love it even more! How do we go about purchasing this? Is it available yet! So Gorgeous! Going to make this my first 2012 project! It is making its way to shops through distributors right now, but I know you can purchase it through www.fatquartershop.com as a retail customer. Also www.sewmuchfun4you.com, a local shop in Charlotte, had it last I checked. Hope this helps!